Here we are in the middle of April. After the winter we’ve had, I’m grateful for signs of spring. Yes, even the stormy morning we’ve having here. I’m also grateful for the signs of new perspective in my life. A spiritual new life, if you will. The process God’s had me on for awhile is intertwining imperfection and light. The message of letting go of my perfectionist tendencies so I can see Jesus in my ordinary moments is one that has been spoken into my life through books, songs and friends. Different versions of the same message have found their way into my heart. And I’m noticing as I focus on this one message, I keep hearing it. Like songs of spring. God created the light that is day and the darkness that is night. And he’s been in charge from the beginning. I want to be a light that glorifies him and in doing so I know he lightens my load, giving me more opportunities to delight in everyday life. Now it’s your turn. Is it a theme of your year on you anticipated or one that surprised you? How has that message been reinforced through your life? Tell me about the songs you’re hearing these days. If you share in the comments, you’ll be entered to win a mix CD with these songs and others I’ve been liking. I’ll randomly choose a winner Monday, April 21. I’m linking this post with others who are reflecting on their One Word for 2014 over at Circles of Faith. If you’re looking for more resources, “Love Idol” by Jennifer Dukes Lee and “No More Perfect Kids” by Jill Savage and Dr. Kathy Koch have been instrumental in my journey. 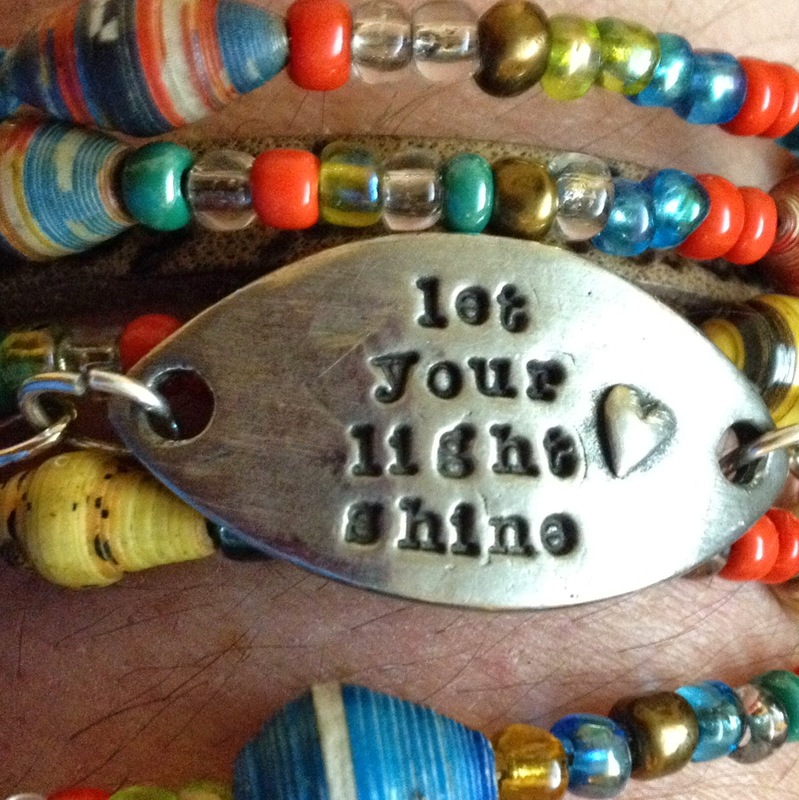 The bracelets … a few people have asked about my bracelets. The silver one is from DaySpring.com and is designed by Lisa Leonard. See it and other bracelets, necklaces and charms here. The beaded bracelet is one piece that wraps around from WorldCrafts, which sells beautiful handmade jewelry, hand bags and other products that help women living in poverty. I’m linking this post with Circles of Faith, Soli Deo Gloria at Jen Ferguson’s blog, Inspire Me Monday at Angie Ryg’s blog, Three Word Wednesday with Beth Stiff, and Holley Gerth’s Coffee for Your Heart. YES – all great songs!! Wow…Ellie Holcomb is singin' my song. What a wonderful rich post Krisin. Love this!!! So many good songs. I love how you are able to combine your One Word and the Love Idol you are giving up. God is SO good!! My theme continues to be focused on my word JOY. I might not have a post directly related to an update but I feel as though every post is written with that desire to really know "The joy of the LORD is my strength." Blessings to you, friend. I'm counting down the days…. Isn't that neat how God has this whole thing intertwined? It's been like that for more than a year now. Perhaps I just need to grasp what He's trying to teach me! 🙂 I'm counting down the days too, Beth! So looking forward to hanging out in person! I love that Andrew Peterson song — one of my favorites. I always wish I listened to more music … it is time, eh? Just consider this some songs to start with. Come back when you need more recommendations. 🙂 Thanks for stopping by! I'm glad you liked her – she's been a good soundtrack for my life lately. Love seeing your face here, Jen!